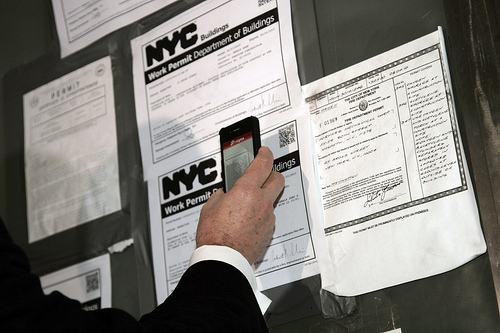 Mayor Bloomberg demonstrates how to scan QR codes on building permits. Photo: Edward Reed/flickr. Vox populi. Complaining just got easier for neighborhood watchdogs in NYC. This week Mayor Bloomberg announced that building permits posted at construction sites will soon have QR (Quick Response) codes that can be scanned by smart phones. A wave of the wrist will bring up all the particulars of the construction site online and allow passers-by to report anything amiss or just find out more about project. More details about digitization of the buildings department on the mayor’s website. Gardens grows. The Architect’s Journal reports that Aedas, Glenn Howells, and Jestico + Whiles have been selected to design the replacement for Robin Hood Gardens housing complex in east London. The plan for the £500 million development includes the demolition of the early 1970s buildings designed by Alison and Peter Smithson. Midlife crisis. Owners of mid-century modern homes in Massachusetts are retrofitting aging residences designed by TAC and other firms, equipping them for the future and saving them from the wrecking ball in the process, writes Kathleen Burge in the Boston Globe.